The history of the Anonymous 12-Step recovery program has been one of inspiring examples of success, combined with a very high rate of failure and recidivism. To be fair, the program was created for a very different time and a very different sensibility. As we expand the application of the 12-Steps beyond substance abuse, we must remember that its original and core design was as a spiritual process. In these times, with cross-cultural beliefs and ideas, the challenge and opportunity is finding best practices in word and concept for the world we live in today. Walking back from the crack dealer's house was always the hard part. With her seven-year-old in tow, no promise of "never again" could convince. Even seven-year-olds know better than that. Fast forward to another life and a higher purpose: Walking off the stage at Madison Square Garden after singing with Rod Stewart, Bette Midler, Beyonce' or Barbra Streisand—and having her life story featured on the Oprah Winfrey Network (OWN). 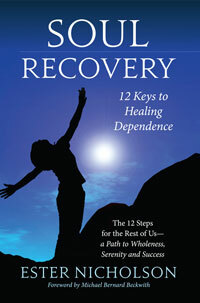 Ester Nicholson, daughter of a Baptist minister, renowned vocalist, former addict, teacher and author of Soul Recovery - 12 Keys to Healing Dependence – finally realized what her healing called her to: A mission worth living for.